W&L Helps Girl Scouts See the World — in Lexington For World Thinking Day, W&L's foreign language teaching assistants led local Girl Scouts in a variety of internationally themed activities. Ekaterina Tsvetkova ’20, Lucia Cespedes ’17, Mengsu Kong, Michiko Nakada, Nao Okada ’17, Imad Baazizi ’17, Camille Bouillon ’17 and Anna Jerusalem ’17. Every February, Girl Scouts all over the globe celebrate World Thinking Day, an occasion that is meant to promote global awareness and connect girls to the cultures of the world with special activities. This year, as in years past, Washington and Lee University’s Center for International Education got in on the fun, sending a group of foreign language teaching assistants and students to spend time with about 45 local Girl Scouts ages 5-12. Lexington’s World Thinking Day event took place on Feb. 11 at R.E. Lee Memorial Episcopal Church. There, the W&L students and FLTAs set up seven separate stations for internationally themed activities, and the girls, parents and scout leaders rotated through the stations for hours of fun and learning. Michiko Nakada and Nao Okada ’17 showed girls the art of origami, teaching them how to make origami hearts out of colorful paper. Camille Bouillon ’17 showed guests how to make crepes, and everybody enjoyed sampling the fruit of their labor (with tasty fillings, of course). Imad Baazizi ’17 showed girls how to write their names in Arabic, while Lucía Cespedes ’17 got them on their feet for a traditional Argentinian dance. With Mengsu Kong, scouts cut colored paper into the shape of the Chinese letter for spring. Ekaterina Tsvetkova ’20 showed them how to make bracelets for Baba Marta, a Bulgarian holiday that celebrates the coming of spring, and Anna Jerusalem ’17 supplied the materials and instruction for painting eggs. “It was a great pleasure for me to work with these motivated and open-minded young women and to see how eager and interested they are in learning new skills,” Jerusalem said. While W&L classes are never taught by foreign language teaching assistants, they do assist during classes. 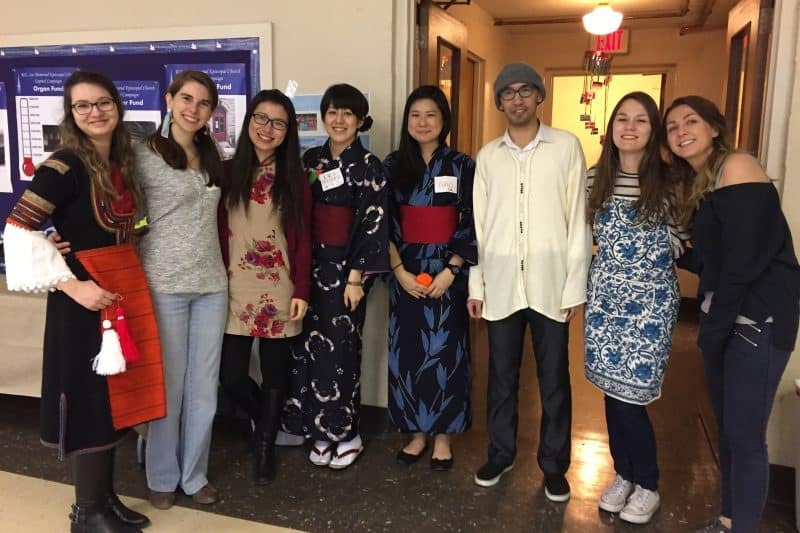 They also conduct language tables over lunch or dinner, where students can practice speaking the languages they are studying, and they spend time developing cultural events on campus and in the community. Amy Richwine, international student advisor and associate director of the Center for International Education, provided photos of the event (see slideshow below).